2018, there’s so much to say, the year started great and then a once-in-a-lifetime opportunity presented itself and finished a sparkling success. Matt Myatt began 2018 with Village Realty and finished as a franchise owner of Keller Williams Outer Banks. Crazy, right? Yes, but in a good way. As with many professions, each year brings about a fresh and energized approach, Outer Banks real estate is no different. Stay tuned for Matt’s numerous new listings and exciting things to come, as 2019 is buzzing along. 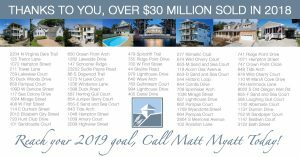 Also, don’t forget to register on MattMyatt.com to receive all the updated listings and information customized for you and your OBX real estate interests. ** stats provided by Outer Banks Association of Realtors MLS data 1/1/18 – 12/31/18 and also 1/1/04 – 12/31/18.